Explorez les principales attractions de Milan lors d'une visite à pied de 6 heures. 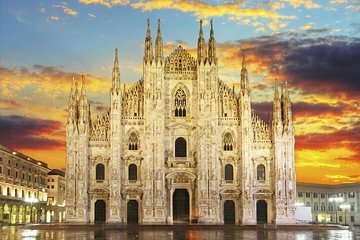 Sous la conduite d’un guide, visitez le Duomo di Milano, la plus grande église d’Italie, et profitez de votre choix entre une entrée coupe-file pour ‘The Last Supper’ ou une visite du vignoble de Léonard de Vinci. Découvrez les célèbres places de la ville, promenez-vous dans le quartier de la mode et découvrez les endroits populaires auprès des habitants. Les nombres sont limités pour que l'expérience soit aussi intime que possible. Nombre limité de personnes pour cette visite en petit groupe afin de garantir une expérience personnalisée. Choisissez de visiter la «Cène» de Léonard de Vinci ou son vignoble lors de cette visite des hauts lieux de Milan. Commencez votre journée sur la Piazza Luigi Cadorna, où vous rejoindrez votre guide et votre petit groupe. Préparez-vous avec des chaussures de marche confortables et des vêtements couvrant les épaules et les genoux, car le code vestimentaire est en vigueur dans de nombreuses églises. Envolez-vous pour découvrir le célèbre Duomo di Milano. La cathédrale gothique est la plus grande église du pays et la cinquième plus grande au monde. Elle a duré près de six siècles. Les foules se rassemblent tôt à cet arrêt, mais vous contournerez complètement les lignes avec votre ticket d’accès direct. Rendez-vous ensuite à l'un des plus grands centres commerciaux du monde en passant devant la Galleria Vittorio Emanuele II du XIXe siècle. Ensuite, évitez les files d'attente à l'intérieur de l'église San Maurizio al Monastero Maggiore avant de vous diriger vers d'autres attractions majeures, notamment l'Arco della Pace, le parc Sempione et le Castello Sforzesco datant du XVe siècle. Découvrez les œuvres du controversé Maurizio Cattelan et l’illusion d'optique de Bramante à l'intérieur de l'église Santa Maria presso San Satiro. Après avoir pris une pause pour acheter votre déjeuner, rendez-vous à l'église Santa Maria delle Grazie, classée au patrimoine mondial de l'UNESCO, qui abrite Le dernier dîner de da Vinci (si l'option est sélectionnée). Contournez les foules avec votre billet coupe-file, examinez de près le célèbre tableau et apprenez-en plus sur sa restauration. Sinon, dirigez-vous vers le vignoble de Leonardo da Vinci (si l'option est sélectionnée). Après avoir été abandonné pendant de nombreuses années, ce trésor historique a récemment été restauré exactement comme il était à l’époque de Léonard. Découvrez comment les racines du vignoble ont été sauvées et cachées sous les terres après les incendies de la Seconde Guerre mondiale. Promenez-vous ensuite dans la Via Montenapoleone, dans le quartier de la mode de la ville. Après une journée complète d’exploration, votre visite se terminera à votre point de départ initial. The chosen trip was excellent. The Serena Guide is very well prepared. We've learned a great deal. We explored new places. We saw for the first time the painting of Leonadro Da Vinci - The Last Supper and all the explanations were wonderful. I recommend this trip! 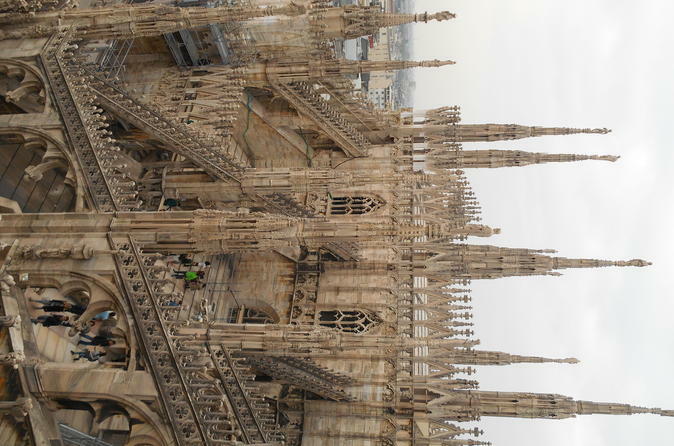 Having just a single day to tour Milan, the Best of Milan Experience from Viator turned out to be an outstanding choice. Being able to choose a tour with an English speaking guide was important and I have to say that I could not have asked for anything better. Our guide was extremely knowledgeable about the art, religious, and architectural history related to each of the tour highlights. The level of detail that he explained and described things was outstanding. The fact that the weather was picture perfect made it all that much more enjoyable. Meeting place readily located; tour guide "Ana" spoke slowly/clearly in English, was friendly, knowledgeable and organized. We were a group of ~20 people.Ana did NOT carry a sign, flag, or anything for us to easily spot/find her. Our first point of interest was the castle (Sforzesca). As we emerged from the castle, she pointed out a large fountain and told us we should take a picture of it. We did that--and promptly lost Ana. We could hear her, but despite searching frantically through the crowds (there were MANY groups of tourists) all around the fountain as well as the exit area of the castle, we could not find her. We heard her say "let's wait for a few people..." but she never described where she was or any landmarks to help us locate her. After a while, her voice went static and then faded out. We asked several people to call the number on our voucher--the people who spoke English could not understand the outgoing message (in Italian--nor could we), and the three different Milan Police officers we approached said they "do not have phones." (seriously!?! )Then we we heard Ana's voice on our devices and thought she must be nearby, but it was another guide--she and her group were on the same frequency. False hope!At the outset, Ana had mentioned the places on our itinerary, and we remembered that Duomo Square was on the list, and the Last Supper would be our "last" stop. We could see Duomo Square in the distance, so we walked over. The Square was packed with people. We spotted a Police officer who was talking on a cell phone. Thankfully,THIS officer was friendly and willing to help us. He called the tour office, gave our names, Ana's name, our tour name, and where we were. After some Italian back-and-forth, he told us Ana now knew where we were and would come to find us. We just had to wait there. Whew! Sure enough, 30 minutes later, we heard Ana's voice on our devices, then we saw her approach. She did not seem to take losing us very seriously, making light of our reaching Duomo Square ahead of the group. Re the places we'd missed (Teatro La Scala, and 2-3 other places), she just shrugged ("oh well--too bad!") Throughout the rest of the tour, as we moved from place to place, even boarding buses en masse, we noticed Ana never stopped to count heads.Enjoyed (what we got of) the tour, but deemed Ana's failure to keep tabs on us less than professional. After Last Supper, we were on our own to find our way back! Excellent tour guide who had to adjust to many scheduling factors. She was so informative and interesting. She's a real keeper. I really enjoyed the walking tour of Milan, Christina was the perfect guide, very personable and knowledgeable. Seeing the Last Supper was of course the highlight of the day. I don’t often do group tours but this one was quite enjoyable. Our guide was very friendly and knowledgeable. We were able to learn a great deal of fun facts about Milano's rich history and culture. It is a great way to spend a day in Milano! It was a long day, but a great day. Our guide Chiari led us all over the city showing us the hidden beauty of Milan. We very much enjoyed her insight concerning the Cathedral and the Last Supper.